Decision-making is the lifeblood of any good business. From deciding to start the business, in the first place, to making the hard calls on how to establish and grow it for ensuring profitability, business decisions are a part of your everyday life. The trouble is, they're with you every day and at every hour. Sometimes, they can become overburdening and overwhelming. The constant barrage of business decisions facing you might even become debilitating, leaving you spinning in circles or stopped in your tracks. When this happens, your decision-making insight diminishes significantly, sometimes leading you to make bad choices despite your best intentions. Here's how to get in front of the decision-making dilemma to ensure you're at your tip-top thinking ability before you declare "yea" or "nay." Some of us leap out of bed full of energy and outlook for the new day that has dawned, ready to move mountains before lunchtime. Others are slow to join the waking world, needing at least two cups of coffee before you can even decide which socks to wear—if you decide to wear any. You're not sure. The point is that we all have our different ways of greeting each day's challenges and opportunities, that is, decisions. While you can't always make your business work exactly how you wish it would, you do need to understand when you're at your peak mental processing period and work toward making that your daily designated decision-making time. Line up your top decisions to be made the night before then get a good night's rest, knowing you have your work ready and waiting for you first thing in the morning. Conversely, start your day slowly, letting your natural brain rhythms guide you into the day ahead. Enjoy your coffee and your quiet time up to the point that your brain kicks in and says, "Ready—let's go!" If you have a decision to make and you're mentally flagging, decide that you'll decide later. Sometimes a decision can percolate in the back of your mind and bring you to a better resolution than if you try to force a decision when you're really not capable to do so. Consider sleeping on it and see what the morning brings. There's no denying our own thought patterns and energy cycles. Some times are better than others for making decisions. Try to maximize the best times to make your decisions, so you can avoid making bad decisions when under pressure or lagging with fatigue. Of course, to truly utilize your best decision-making time, you need to decide that you will find time to get adequate rest, nourishment and even exercise. Some of your best decisions can be made on a bicycle or during a brisk walk. Besides accommodating your body's thought-clock, you also need to consider your personal style in making decisions. Do you prefer to take your time and fully think through your decisions before committing? That's fine, but it will take more time. Or, are you the sort who likes to process pros and cons quickly, make the decision quickly and move on to the next item of business? If so, you need to ensure you are always armed with the best information so when you make the quick call, you'll know you've done so based on reliable facts and data, and not just on emotion or expediency. Many successful business owners have combined both styles just mentioned. They assess the decision to be made and determine if they have sound basis and judgment to make the call now, or if they need more information before they can be comfortable in what they'll decide. The bottom line here is that if it doesn't feel right, don't decide yet. Then again, if you don't believe you have all the information, but you have a compelling gut intuition, well, that may be enough to seize the moment. When faced with these sorts of spontaneous decisions, ask yourself how well previous decisions of this sort have gone for you. Let your own track record lead you in determining if this is the time to take more time, or if this is the time for a bold and fast move. But what if you have taken steps to utilize your best decision-making cycle and understand if you're a "let's think about it" or a "let's do it" sort of decision maker… and you still have trouble making a decision (and sometimes make bad ones)? Oftentimes, this is a situation where you're not certain of what you're hoping or expecting to achieve by making the decision. If anyone were to ask you, "why did you decide to do that?" and you can't provide a reasonably sound answer, then you might have lacked the vision of knowing what effect your decision would have (and what you hoped it would have). In cases like this, you need to have a view of how the decisions you'll make will affect your goals. Will this get me to my business goals, and how do I know that? Will this improve the way I'm doing business, or am I only guessing it will? If you'll take the time, you can often work backward, starting by defining your end goal (short-, mid- and long-term), then identifying the decisions you'll need to make to get you there. Other decisions you'll face that you hadn't anticipated will often still fall within range of those you've pre-defined. If they don't, they might be things that will truly take you off course, so beware. Making decisions can be taxing, tiring and, sometimes, troublesome. 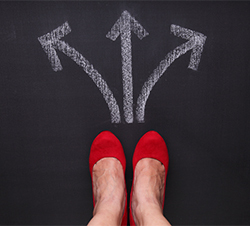 Running a business, however, is based on making decisions. Your goal is to put yourself—and, thereby, your business—in the best position for making good decisions, while remembering to understand and learn from any bad ones. Will you become the best decision maker you possibly can? That's up to you to decide. I really enjoy your articles and perspective on so many aspects of building a successful business. This article on decision making really hits home. I have had to make all the decisions recently regarding a business my husband and I have run for many years after he passed away six months ago. The points you make reassure me that I am not crazy-just in a tough situation needing to make tough decisions. And my decision-making processes are valid and come in the variety of ways that you describe. Bottom line is I need to make business decisions that will give me the best chance for success. Many good points! I have almost never been disappointed by a decision to not do something that I wasn't feeling sure about!